Keeping the correct electrolyte levels in your industrial batteries is the key to securing long life and capacity. Batteries lose water to evaporation due to gassing at the end of a charge cycle and general equipment operation. Increased ambient temperatures also contribute to the rate of evaporation. The electrolyte level in your battery needs to be adjusted frequently by resupplying the water that has evaporated. Failure to replenish this lost water can create irreparable damage to the exposed lead plates, creating a capacity loss or failure of the battery. MCP offers on-site battery watering programs to help you with this issue. An experienced MCP technician will monitor your battery usage and water levels to tailor a program to your specific need. 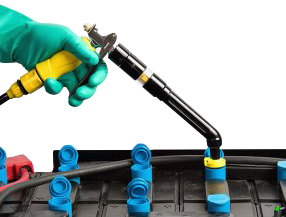 We will water your batteries at a frequency that will ensure proper maintenance and good battery health. Call today for an evaluation!